Fresh tomatoes are readily available in August. 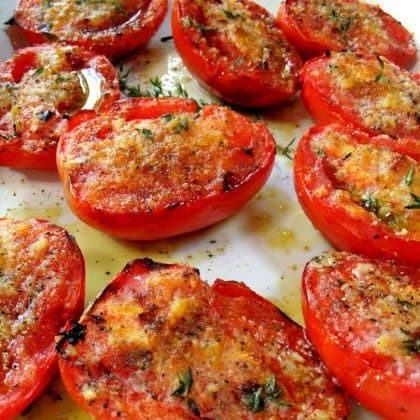 Grilled Parmesan Tomatoes are one of our favorite family recipes, and we have it at least once a week during the summer. It is low calorie and tomatoes are very nutritious. The American College of Cardiology reports lycopene, the red pigment in tomatoes, can reduce heart disease risk in middle-aged women by 1/3. Set oven to 300 degrees F or heat grill to medium heat. Drizzle balsamic vinegar on each tomato half to your taste. Serve piping hot, tender and juicy. Yum!